Why are you using a cover of the most popular character in your manga, Hata? It should be all Nagi ALL THE TIME! Synopsis: Hina has passed out from her self-imposed sauna battle with Hayate and does so with a thud. So Hayate goes to the source of the sound and finds a half-naked Hina unconscious on the floor. The towel slips off of her as Hayate is trying to help her out so he sees "everything." Hina awakens inside the hut in front of the fireplace and discovers that she's wrapped in a towel and completely naked underneath. Hayate greets her and he has a blindfold on. He says that it's to make sure that he didn't see anything. She thanks him for saving her but can't help asking if he saw anything. Hayate lies through his teeth, of course... but he's a terrible liar, so Hina immediately sees through it. Anyway, back to the people who didn't attend the orientation, it seems that they've all been locked up in the prison hotel -- which was actually a real prison. The men in black insist that it's not a prison but a hotel, but everyone has been put into a jail cell and dinner is a cold piece of bread. They are then shown a screen wherein those who have already given up are treated to good food and luxurious accommodations inside a real hotel. They are told that if they can't stand their situation any longer, then all they have to do is press the button on their completers and they'll be taken to the luxurious hotel immediately. Kayura decides that she's staying. Back to Hayate and Hina, Hina is curious as to where Nagi has gone and Hayate explains how she went on ahead to win the orientation. Hina correctly deduces that if she left Hayate here, then she doesn't want him to pay off his debt. Hina then decides to ask Hayate out of the blue just what type of girl he'd like to go out with if he didn't have the debt. She immediately realizes that what she did was like an implied confession, but of course, Hayate is totally oblivious to this and after pondering the question, he answers that it must be a queen or a joou-sama. Hina thinks that it's abnormal that he'd like someone who'd lord it over him. 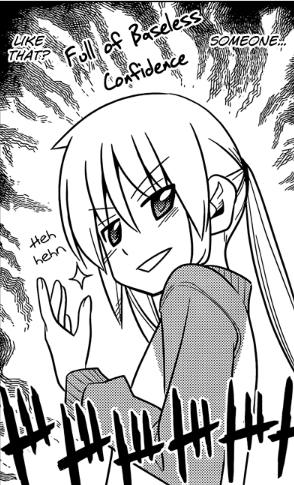 We then get a panel showing that it was Athena who was in Hayate's mind all along. Hayate then clarifies that he just likes confident women, which makes Hina think of Nagi with all her baseless confidence. She then remembers how Nagi can't ski so she's confused as to how she even left the place on her own. Hayate says that it was a classmate named Tsugumi Ruri who drove her. Hina doesn't know who that is and that she's memorized every single Hakuo Academy student. This makes Hayate realize what a dunce he's been all along. Review: Okay, let's get it out of the way first: Athena is definitely Hayate's type of girl. If you got this far without even knowing that much... then, which manga have you been reading, son? 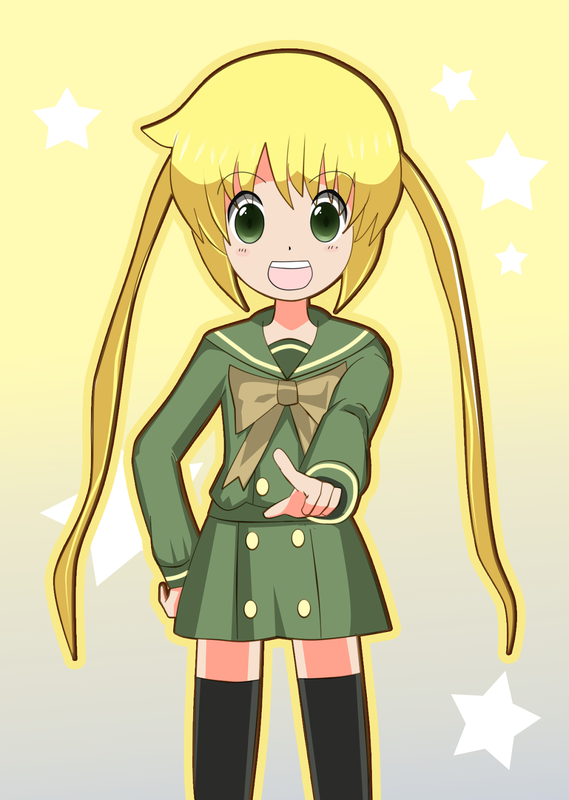 Hina's image of Nagi is not that far-off. Of course, she did sort of grow out of this during the comiket arc. With that said, you should also realize that to Hayate, this was him making small talk and just blurting out the first thing that came to mind after Hina's sudden question. He just confirmed what we already knew all along -- you don't say that you "loved" someone if they're not even your type after all -- and really, it hasn't been all that long since they impliedly (everything is implied in this manga -- get used to it) "broke up," so you can't really expect Hayate's "type" to have changed all that much. I really don't see this as having any long-term implications in the manga. That's as much as I will say on that subject, but feel free to discuss if you have anything to say, of course. 1. If this was the case, then Ruri Tsugumi wouldn't be needed to offer Nagi a new reason to win the contest for herself. Remember that Ruri makes it a point to try and convince Nagi to win the contest for herself. 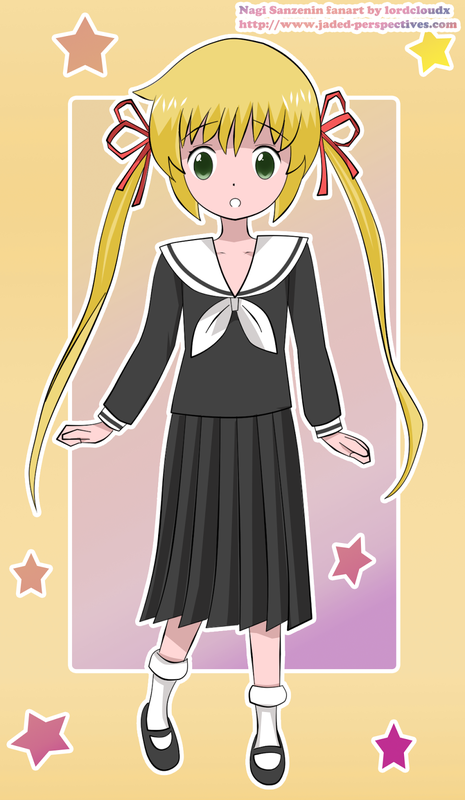 You could say that she never knew what Nagi initially wanted to do, but then we have the fact that after talking to Nagi, Ruri manages to make her take positive action by leaving Hayate behind and trying to win the orientation all by herself. 2. Hinagiku's deduction was that if she left Hayate, then that must mean that she doesn't want him to pay off his debt. You might think that this is proof that Nagi does want to keep him in debt, but try to analyze Hina's "correct" deduction here: The premise is that "if she left Hayate," but before Ruri gave her a new reason to win this contest for herself, it should be noted that she was together with Hayate all this time and that she had no apparent plans of leaving him. Of course, I've also thought of the counter-argument that she needed Hayate to win this contest -- and to that, I'd say that I'm sure she's confident (baseless though it may be) enough in herself to try and win without relying on Hayate, who would no doubt be her greatest enemy in this competition if her main motivation was to prevent him from paying off his debt. Of course, this point is moot now since Nagi has been given a new reason to win this contest by Ruri Tsugumi, so if you still disagree, then let's just agree to disagree. Anyway, we're up for a short break next week, but at least it promises to be a Nagi chapter. Edit: I'd just like to note that Hayate really shouldn't have let Nagi go off with Ruri like that in the first place. I hope something terrible does happen to Nagi and that she comes away from it relatively unharmed on her own (with a little bit of luck, which she has plenty of) and none of Hayate's help. A minor question regarding the translation: I'm pretty sure that Hina used the word "abnormal" to describe Hayate's "type" of girl when he said that he wanted a queen. I'm wondering why they didn't keep that in the scanlation. I actually thought Hina's observation this chapter was fairly interesting. I don't think she's wrong to assume that if Hayate likes confident Ojou's then Nagi is actually his type as much as Athena is. But that's just one more in a long line of Athena/Nagi parallels, really, with the implication always that Athena represents his past and Nagi his future. Well by itself it's still not that interesting, but throwing it out there early in an arc that will very likely end with Nagi confessing to Hayate or something similar, (To match CTMEOY) is...hmmm. Especially as this also seems to be leading to Hina seeing Nagi as a rival for the first time. That's a great point about "past" and "future." It's also one of the many overarching themes in this manga, so it really fits the story quite well. Thanks for bringing up these interesting points... anon who seems vaguely familiar. Yes, I thought that it was a great thing that there's at least one more person (I don't think Ruka knew that Nagi was in love with Hayate... I could be wrong.) taking Nagi as serious love rival other than the hamster who will never get anything done. What I found interesting is how Kayura was completely fine staying in the prison,which is a nice little reference to how until fairly recently, she had been living on the street, so this is nothing to her. And Hina's assumption is technically correct, just she doesn't know the motivation behind it and assumes Nagi is just being selfish again. It seems Chiharu will be enduring the prison cell as well because friendship is magic! Y'know, it just hit me that if Nagi ever did get in trouble, then Ell-chan could come to save her instead of Hayate -- assuming that she didn't go with Fumi and Sharna to work in that factory. Remember that before they fell into water, Nagi was asking if Hayate would stay with her even with his debt cleared. In my reasoning I think she was coming to terms that it would still be okay if Hayate won, and that she didn't have to do it by herself. What Tsugumi told Nagi was that it would be not okay if Hayate won, and that renewed Nagi's determination to win on her own. What I would suggest is that Nagi's determination to win the trip keeps on changing. She has been struggling with this issue over the past few chapters. Sometimes she wanted to win it badly, sometimes she softens. That being said, Tsugumi offered a new perspective which has nothing to do with Hayate leaving or not, but his entire existence, so that Nagi would remain determined to win on her own till the very end. In this sense, our debate on Nagi's intention is no longer relevant. I won't disagree that Nagi might have been feeling very conflicted before Tsugumi gave her an excuse to try to win the contest by herself (which is probably one of the reasons why she was so gullible to Tsugumi's stupid story). It's just that I still can't accept that her initial motivation to win was so that she could keep Hayate all to herself. It just doesn't seem like something that she would think of doing "for Hayate's sake." With that said, although I do agree that Maria's words might have triggered it recently, I think Nagi asking Hayate to stay with her even if he pays off his debt is actually a continuing manifestation of the feelings of insecurity that she's been having about Hayate's feelings for her recently. Remember that from her perspective the chapter 413 incident (catching Hayate hugging Ruka from behind and promising to "definitely" make her happy) has never been truly resolved and that at the end of Ruka's arc, Hayate was feeling quite down about not getting to marry Ruka and she had to cheer him up. Since that time, Hayate has never given her any hints as to where she might stand in his life, which is why Nagi was so eager to believe Tsugumi's story that takes it for granted that Hayate has feelings for her. I guess I should add that the one hint he did give her recently was in Ikusa's arc wherein he declares that he'd risk his life for her. I don't think that stands for much when that's what he's been doing all along though.